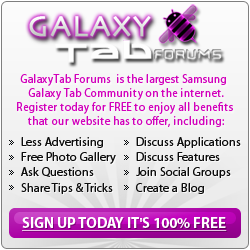 Welcome to GalaxyTabForums.net, a Samsung Galaxy Tab forum that features tons of Samsung Galaxy Tab 10.1/8.9/7" information and help. We aim to be a friendly, educational community dedicated to all things Galaxy Tab related. We offer assistance with Android, Galaxy Tab Apps, Accessories, Development, Galaxy Tab Help and more. Galaxy Tab 10.1 Forum - The main area of our site that covers the Galaxy Tab 10.1. Galaxy Tab 10.1 Help - If you need help with your Samsung Galaxy Tab 10.1, ask in this forum. Galaxy Tab 10.1 Accessories - Discuss the various Galaxy Tab 10.1 Accessories available here. Galaxy Tab Applications & Extras - Discuss Apps/Games/Audio/Video and Graphics in this section. Galaxy Tab 2 Forum - Discussions for the new Samsung Galaxy Tab2s!